We recently expanded our Schools2SkillsTM program to educate high school and middle school students on careers in health care. The first Schools2SkillsTM Health Care tour took place in October 2018. Forty-five students from Oconomowoc High School, Arrowhead High School and Mukwonago High School visited ProHealth Care’s UW Cancer Center to learn about careers in nursing, pharmacy, imaging, physical therapy and more. Professionals in those fields talked to students about why they chose their career, what their job duties include and how students can get started in the industry now. Students were able to ask questions of the professionals to learn more about jobs in health care. Schools2Skills™ started in 2011 to give Waukesha County high schools the opportunity to tour local manufacturers, see firsthand the innovative and advanced technology right here in southeast Wisconsin and learn about what careers are available in the industry. Schools2Skills™ Manufacturing is dedicated to educating students about what the manufacturing industry has to offer, showing them that a career in manufacturing allows those with highly technical skills to excel and succeed. In seven years, more than 3,000 students, parents and educators have toured more than 100 manufacturers. During the 2018-2019 school year, the Alliance piloted two Schools2SkillsTM Health Care tours with ProHealth Care, with the goal to expand the program with additional health care providers in the future. The Alliance is also expanding its Schools2SkillsTM Manufacturing tours. Twenty-six tours, a record number of tours in one school year, will be hosted, and we are giving middle school students the opportunity to participate in the tour program. In addition, we launched our Careers Uncovered program in March 2018. Careers Uncovered is designed to help Waukesha County educators learn more about the career pathways offered in Waukesha County’s key industries. Educators visit a local company to learn about the career pathways available in the industry, tour the company, network with employees from all areas of business operations and have a roundtable discussion with company leadership. 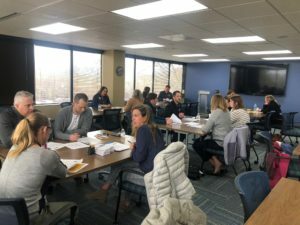 The experience concludes with educators working together to reflect and put together an action plan to apply the knowledge they gained to assist with the academic and career planning process. We hosted seven Careers Uncovered programs for 76 educators in our pilot year. These programs have been an important part of our workforce development strategy. The focus of the “develop” tenet of our strategy is to develop our future workforce by partnering with K-12 and post-secondary institutions to expose students to all the career opportunities in Waukesha County. With the unemployment rate in Waukesha County at record lows, all industries and positions are in need of employees.